There are records of horses being raised systematically in the Kiso region of Nagano Prefecture, Japan, as early as the 6th century. The region produced, according to legends, 10,000 cavalry mounts for Kiso Yoshinaka's army. It is thought that these small horses were introduced from Korea in the third century. They are similar to Tarpan and Mongolian horses. 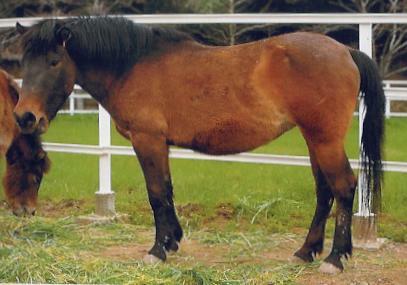 During the Meiji Era, the Japanese government had Kiso stallions castrated and imported larger stallions to cross into the breed to increase the Kiso size. Luckily, one stallion that survived the castration process, Shinmei, is the single sire who saved the breed. By the use of back breeding the breed's purity and original form remain. However, the Kiso breed is rare. The breed is being preserved in the region centering on Kaida mura in Kiso County, Nagano Prefecture. There are today 117 Kiso horses, which are often seen in processions in local festivals. They are also used as riding horses. They have large heads, a short, thick neck and short body. Their withers are low and flat. They stand 13 hh at the withers. Although they are pony sized, they are considered a horse because of their physical characteristics. A dorsal stripe runs down their backs from the mane to their tail; which is considered to be a primitive marking. They have strong hooves.